I’ve discussed the importance of creating multiple streams of income in your business in the past. 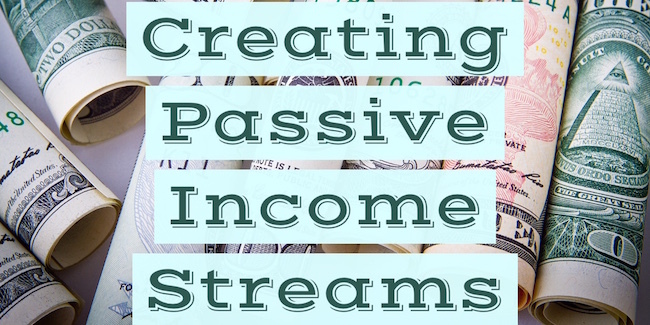 This time, I want to zero in on creating passive income streams in your business. Passive income refers to money you didn’t have to trade your time for. Freelancing, for example, is active income because it requires you to trade the time you spend using your skill (like writing or designing). Consulting is also active income because you have to be on the phone with a person for a period of time. Passive income, on the other hand, is money you can make with minimal work. For example, you write a blog post with affiliate links and then make commissions of affiliate sales. Before getting into how to create passive income streams, I first want to discuss some of the misconceptions. A lot of people sell passive income as a way to make money in your sleep. The idea they try to sell is that you don’t actually have to work. This is only half true. Passive income streams do allow you to make money in your sleep, but you still have to work. At the very least, you have to feed it. If you want to make money with affiliate commissions, you have to write and promote blog posts. Same with ad revenue. If you want to make money in real estate, you have to work on upkeeping and maintaining the property. If you want to make money in the stock market, you have to do your research and actually invest some money. The difference is the amount of work required. With passive income streams, the idea is you do the work up front and then continue getting paid even when you’re not actively working. One way to add passive income streams to your business is with affiliate sales. This is when you partner up with a service or product, recommend it to your clients (or customers, or blog readers), and then make a commission when they purchase. This is a great way to make passive income because you don’t have to actually create the product, you just have to find ways to recommend it and promote it. Michelle Schroeder-Gardner has a great class on affiliate sales and how to add this income stream to your business. Another way to add passive income streams to your business is to create and sell some of your own products. This could be like writing a book or creating a course that you then sell over and over again. I make some money off of my book every single month. While it’s not enough to sustain my living expenses, it definitely helps and all I had to do was write it once. Another form of passive income, particularly online passive income, is ad revenue. If you go to a website you may notice ads on the side bar. This is usually because the site owner is a part of an ad network that pays them money passed on page views, impressions, and clicks. While it would take a lot of effort to make a sizable income with ad revenue, it is worth looking into for extra cash flow.